With Independence Day looming, it seems only fitting that I dedicate this Friday’s Fabulous Find to one of our Fabulous Founding Fathers. I found a rather curious object at a lovely chateau in northern France. George Washington’s wood has been polished and lovingly preserved at Château de Boucéel in Normandy. Wood in the very literal, not the metaphorical or slang sense (cheeky monkey). On a clear, crisp evening in March, the Comte de Roquefeuil invited me into his study and told me the story of our founding father’s wood and how it came to be at Château de Boucéel. Apparently, one of the Comte’s ancestors lent his support for our great cause. In return, George Washington sent him several tulip poplar trees from his Mount Vernon gardens. The trees grew on the grounds of Chateau de Boucéel until the devastating 1999 blizzard when heavy winds and thick snow took down the last original tree. Today, there are saplings growing on the grounds of the estate that sprouted from George Washington’s original tulip poplars. The Comte kept a bisection of one of the felled trees and likes to show it to his most special American guests. I am thankful he was kind enough to include me in that group. What a fantastic find and indeed, perfect for this fourth of July weekend! This estate was such a wonderful, historically rich find! 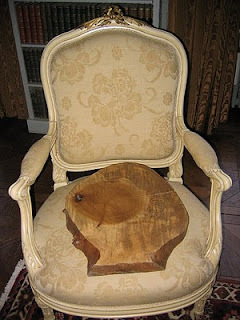 Btw, I also adore that beautiful chair Washington's wood :) is sitting on. Gorgeous, and would love to have one just like that! How fascinating! What a great gift! And...a touch creepy---1999 was the 200th anniversary of Washington's death...coincidence?